JUVÉDERM® XC is the smooth gel filler that can instantly smooth away wrinkles around your mouth and nose. With just one treatment, you’ll get smooth and natural-looking results that last up to a year. 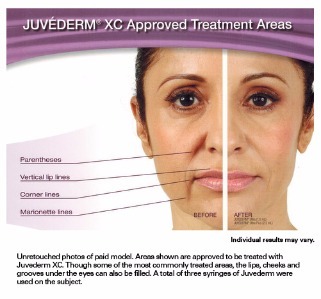 JUVÉDERM® XC is manufactured using HYLACROSS™ technology, creating a smooth-consistency gel. It is infused with lidocaine to improve comfort during treatment. With JUVÉDERM® XC you get the smooth results you expect, with the improved comfort you want. 2. It’s smooth and more comfortable. Not all HA dermal fillers are created equal. Only JUVÉDERM® is so smooth. Other hyaluronic acid fillers currently on the market are made of granular consistency gels, but our unique manufacturing process (HYLACROSS™) creates a smooth-consistency gel that flows easily into the skin and provides a smooth, natural look and feel—so everyone will notice (but no one will know)! JUVÉDERM® XC injectable gel is formulated with lidocaine, a common anesthetic used to improve the comfort of treatment. 4. It’s personalized. One size doesn’t fit all when it comes to wrinkle treatment. A customized treatment plan is important for achieving the best results. That’s why JUVÉDERM® XC is available in two formulations—JUVÉDERM® Ultra XC for versatility in contouring and volumizing facial wrinkles and folds, and JUVÉDERM® Ultra Plus XC, a more robust formulation for volumizing and correcting deeper folds and facial wrinkles. This allows your healthcare professional to tailor treatment to meet your unique needs.